Allegedly, this model is the BEREC 'Pioneer' - a kit radio sold in the late 1950's for the ever-growing home constructor/enthusiast. This may be credible, but there is scant evidence for it and I believe that the serial number would have followed a logical scheme and been prefixed 'P' or 'PK' if this was, indeed, a set called the 'Pioneer'. 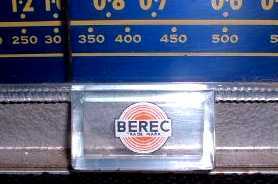 The serial number is on a BEREC label on the chassis and begins 'RC'. If experience with Ever Ready sets is anything to go by then those two letters should tell us the model name - 'Royal Crown' perhaps?. However, it has also been suggested that the 'RC' stands for 'Radio Constructor'. Unfortunately, the absence of a longwave band (replaced by short) demonstrates that this set was, indeed, for export and as I only have domestic data I may well never find this out. 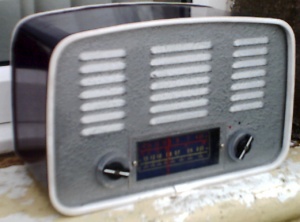 "This radio was produced for export to Africa and Australian Outback in the 1950's"
Perhaps put there by the same person who was responsible for the colour scheme? Or was that former owner confusing this set with the Ever Ready Type 'J' - the infamous 'Saucepan Special' which was, indeed, produced for export to the African market.